Axero offers both phone and tablet apps available to download in the app stores. Apple iOS Requires iOS 9.0 or later. Compatible with iPhone, iPad, and iPod touch. Requires iOS 8.2 or later. Compatible with iPhone, iPad, and iPod touch. 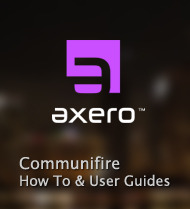 Axero offers white label iOS and and Android Communifire apps for customers wanting to enhance the experience for their users. You can view more about white label pricing here. This guide will walk you through the steps required to successfully white label your app. If you have already completed payment for your white label app, please follow the steps below to submit your app info and creatives to Axero. 1. Download AppPreparation.zip. This file contains a template for all creatives and a word document for app submission details. 2. Creatives in px sizes and .png format. 3. Submit your AppPreparation.zip file containing your creatives and app submission details in a case to Axero. I'd ask if Axero will submit the whitelabel mobile app to Google and Apple stores?, or we will be responsible for submitting it? if so, will the application displays warning for unknown sources while installing it or not? I'm in the process of coming up with an answer for your company about the white label app, you will receive an email soon. The App Store and Google Play links above still go to the legacy app.